Riparian buffers, also known as a vegetated buffer or forest buffers, are vegetated areas along a stream, usually forested, which helps shade and partially protect a stream from the impact of adjacent land uses. Planting trees along streams is a good investment. While growing, and when fully established, your trees will provide you and your neighbors with a host of natural benefits every day: clean air and water, lower energy bills, opportunities to see wildlife and even higher property values. Over half of the Chesapeake region is covered in trees. The vast majority of which is owned by people like you, individuals and their families. That means that vast majority of the clean water, wildlife habitat, and clean air is managed by people like you. You can give back to your community by planting and maintaining streamside trees. It is easy to do and there a people who can help you. 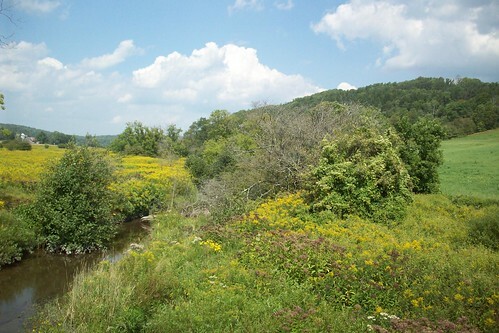 A riparian buffer is vegetation along a stream. This allows contaminants in the water to be filtered by the plants instead of entering the stream. Image courtesy: Chesapeake Bay Program. What animals and plants do you see? Are there patches of dirt eroding into the stream? Are there wet or dry areas? What animals and plants would you like to see? Write these observations down and use them as you plan your streamside tree planting. Different trees have different requirements and can provide different benefits. Did you find any wet spots during your stream walk? If so, you will want to plant trees that are tolerant of wet areas. Did you find any spots with lots of shade? If so, you will want to plant trees that are tolerant of shade. Do you want to attract wild turkey? There are certain tree species that are favored by turkeys.In general, prioritize oaks and do not plant non-native or invasive trees. Oaks are a “keystone species” in eastern forests as they provide food and shelter for a wide variety of animals. Acorns are critical food sources for birds and mammals, oak leaves are preferred by moths and butterflies, and their beautiful fall foliage provides food and nutrients to forest and stream wildlife.Trees like norway maple (Acer platanoides), callery pear (Pyrus calleryana) and silk tree (Albizia julibrissin) were introduced to our region as ornamental plants. They are well adapted to our region and have escaped cultivation spreading into natural areas. They often out-compete native vegetation and tend to form monocultures. Our native caterpillars and other insects also avoid these plants which reduces available food for birds and other wildlife. You will also want to pick trees that will form the canopy of your streamside area and trees that will be in the midstory. Baltimore County’s tree planting guidelines suggest that 80% of your trees should be “canopy” species and 50% should be oak species. Don’t worry. Picking trees can seem difficult, but there are easy to use resources to help you. Your streamside trees are commonly referred to as “buffers” because they lessen the affects of adjacent turf, cropland, and impervious surfaces of roads on streams. The wider you make your buffer, the more benefits you will get from it.Once you defined your planting area, you can begin spacing your trees. In order to encourage your trees to grow large crowns (the larger the crown, the more benefits you will get: shade, pollutants scrubbed from the air, etc. ), canopy trees should be no less than 25 feet apart. Midstory trees can be spaced between fifteen and twenty feet apart. Do not plant trees closer than 15 feet apart.Give trees that will have large crowns when fully grown like white oak and sycamore more space than those that narrower crowns (see table below for help). Now that you have your trees, you get to start planting. Planting is easy, but follow a few steps to give your trees the best chance to provide you with benefits. The best time of the year to plant trees is in the early spring. Holes should be dug to 2 times wider than the size of the container or root ball, but no deeper than the depth of the root mass. See resources below for more information. If you are using potted seedlings, protect each tree from deer and wind with a five foot ventilated tree shelter secured to a wooden stake with two cable ties. Scrape the grass around the planted seedling to remove cover for voles and mice. Do not mulch. Use at 5 foot high tree shelters. See resources below on installation. If you are using potted seedlings, you will need to water only during periods of intense heat or drought. When needed, water each tree with five to ten gallons once a week. Suppress vines and invasive plants. You will likely encounter problems with vines after planting. If vines become an overwhelming problem, then will need to use herbicides. Resources are provided below. If you follow these guidelines, you can expect for at least 75% of your trees to survive after three years. Streamside trees filter pollution like trash and nutrients before they enter streams—they are a stream’s last line of defense. Tree roots are also able to pull nutrients, like excess nitrogren, out of the saturated soils of stream banks. Streamside trees also lower the amount of dirt that erodes into streams from banks, slow the release of stormwater to streams, lessen the effects of flooding, and make streams more resilient to pollution. Planting trees will make you healthier. Tree canopies scrub pollutants like dust, smoke, and ash from the air. Shade provided by trees reduces surrounding air temperatures. Lower temperatures reduce the formation of ozone pollution. These pollutants are known to induce health problems like asthma. Riparian buffer along stream reduces erosion and pollutants from grass lawns while also providing habitat and food for wildlife. Streamside woods are one of the most biologically diverse habitats. The combination of water and native plants create a unique mix of food and shelter that supports many species of wildlife including brightly colored migrating birds and butterflies. Streamside trees also create better aquatic habitats. In a way, fish grow on trees. The leaves, sticks, and other tree matter provide food sources for the small bugs that live in streams and support fish populations. Tree shade also keeps streams cool for species like the brook trout. Planting streamside trees can help you “get away from it all.” A band of trees one-hundred feet wide can reduce noises by 50 percent or more. These and other attributes of trees are known to reduce stress. Sound good? In addition to cleaning water, helping you breathe a little easier and giving you opportunities to see wildlife, trees can also benefit your pocket book. Trees can lower your energy bills and raise your property values.